Probably the most famous neighborhood in Carmel-by-the-Sea is the Golden Rectangle, otherwise known as Southwest Carmel. The boundaries of Southwest Carmel are Ocean Ave to the North, Santa Lucia to the South, Dolores to the East, and Scenic to the West. The homes found in Carmel Ca homes Golden Rectangle can be quite spectacular from panoramic ocean view property to quaint artistic cottages. Click on the link to preview all current homes for sale in the Golden Rectangle neighborhood. For all available Carmel real estate, click here. In 2018, 39 homes sold in this neighborhood. The most expensive home that sold was a 3 bedroom, 2.5 bathroom home with 1,579 SqFt of living space on a 4,100 SqFt lot located on coveted Scenic Drive right overlooking Carmel beach, selling for 7.75 million. The least expensive home that sold was a 2 bedroom, 2 bathroom beach cottage located in the “Golden Triangle” with 983 SqFt of living space on a 4,000 SqFt lot. In 2017, 42 homes in this neighborhood sold. The most expensive home sold for 4.75 million for a 3 bedroom, 2.5 bathroom, 1.517 SqFt home on a 5,300 SqFt lot featuring stunning Ocean views. The least expensive home sold for 1.15 million for a 2 bedroom, 1 bathroom Carmel cottage with 951 SqFt of living space on a 3,920 SqFt lot. 35 homes sold in the Southwest neighborhood in 2016. The most expensive home to sell was a 3 bedroom, 2 full and 1 half bathroom with 1,855 SqFt of living space on an 11,000 Sqft lot and situated directly on Carmel Beach with Ocean views and sold for 8.9 million. 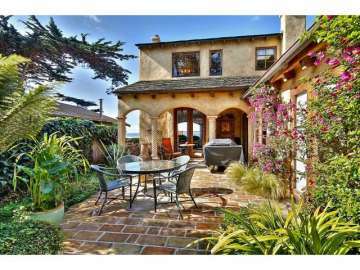 The least expensive home sold for for 901K and was a 2 bedroom, 2 bath condominium located in downtown Carmel-by-the-Sea. 33 homes sold in this neighborhood in 2015. The most expensive home to sell was a 3 bedroom, 3 bathroom beach house with Ocean views just across the street from Carmel Beach with 2,391 SqFt of living space on a 4,200 Sqft lot and sold for 6.5 million. The least expensive home to sell was a 2 bedroom, 1 bath Carmel cottage with 753 SqFt of living space on a 3,920 SqFt lot and selling for 1.175 million. 40 homes sold in 2014 in the Southwest neighborhood. The most expensive home to sell was a 4 bedroom, 3 bathroom property in the Golden Rectange with panoramic Ocean views, 2,387 SqFt of living space on a 6,000 SqFt lot that sold for 4.95 million. The least expensive home to sell was a 2 bedroom, 1 bath fixer upper with 977 SqFt of living space on a 4,000 SqFt lot and selling for 1.2 million. In 2013 28 homes sold in this neighborhood. The most expensive home sold in the area sold for 6.3 million, and was a 2 bedroom, 3 bath home with 2,000 SqFt of living space situated on a 5,400 SqFt lot. The least expensive home sold in 2013 sold for 910K and was a 1,300 SqFt home on a 4,000 SqFt lot. In 2012 42 homes sold. The most expensive home that sold in the Southwest neighborhood sold for 8.1 million and featured 5435 SqFt of living space on .29 acres. The least expensive home sold in 2012 was for 950K with 1340 SqFt of living space and located on a 4000 SF lot and was a 2 bedroom, 2 bath fixer. Many folks living in the Golden Rectangle consider it so desirable because one lives next to the world famous Carmel Village and the picturesque Carmel beach. Famous restaurants, art galleries, shopping, scenic vistas, and world class events can be enjoyed on a daily basis. City Hall is situated in the Golden Rectangle along with the famous Golden Bough Theater which produces bold and daring interpretations of the great plays from the world stage. As a full time resident of a Carmel Ca home in the Golden Rectangle one would enjoy peaceful days with long walks along the Carmel beach, or an enjoyable stroll along Ocean Avenue window shopping, as they sipped their steamy hot latte from Carmel Coffee shop. Dog lovers may enjoy an evening cocktail at the Cypress Inn with their favorite four legged friend as they sipped their wine, tasted tapas, and enjoyed live music in a relaxing social setting. Fitness enthusiasts will enjoy surfing, golfing, walking, running, cycling, or diving along the scenic coastline. Living in the Golden Rectangle does not require ownership of a car, how wonderful living the Village lifestyle and walking everywhere!